The latest Monmouth University poll came out this morning. It sampled 1,402 likely voters and has a margin of error of 2.6%. It doesn’t contain any surprises. Like almost all current polls, it shows Mitt Romney in the lead, in this case by 48%-45%. It shows that almost all Republicans support Romney and almost all Democrats support Obama. It indicates that Paul Ryan is better respected than Joe Biden. It confirms that Obama suffers from a severe gender gap, losing men by 51%-40%. And, like many other polls, it indicates that Romney is absolutely clobbering Obama with independents, 52%-33%. Nineteen points! What I don’t understand is how Romney can be leading by only 3 if he carries independents by 19. If the voting population were 1/3 R, 1/3 D and 1/3, a 19 point lead among independents would give Romney a six-point margin overall. Monmouth says that they weighted their sample to equal 31% R, 34% I and 35% D. That may be in the ballpark, although I suspect that if anything, it is pessimistic for Republicans this year. I tried to do the math using Monmouth’s turnout model, and I still came up with a 4.5 point lead for Romney, which probably tells you something about my arithmetic skills. Be that as it may, it seems clear that if Romney carries independents by anywhere near 19 points, he will win the election. UPDATE: Reader Dana Van Roekel created this spread sheet, which shows how the partisan split used by the pollster does indeed generate a 2.75% lead for Romney. 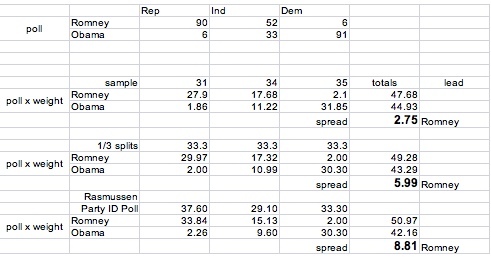 Van Roekel also, just for fun, ran the same numbers assuming a 1/3 R, 1/3 D, 1/3 I split and assuming the partisan ID numbers as they currently are being polled by Rasmussen. The latter calculations would give Romney leads of 5.99% and 8.81% respectively. Our reader also reminds us that these are assumptions about partisan ID, and not necessarily turnout models. There is more enthusiasm among Republicans than Democrats (and, I am guessing, among Romney-leaning independents than Obama-leaning), which is an additional factor. The bottom line, I think, is that Obama is toast. But we wouldn’t want to get cocky!